When it comes to insulation, chances are your home may not have enough. Unless you’ve added extra insulation when building your home, or added insulation to the home you bought or renovated, there’s a 9 in 10 chance that it doesn’t have enough. NAIMA (North American Insulation Manufacturers Association) reports that 90% of homes in the U.S. are under insulated. Why is this? Think about the housing industry. Home builders install the minimum amount of insulation required by code. Why would they install more? The more they install, the more money each house costs to build. We know, from being in the insulation industry for years, that the amount required by code is not enough to keep your home comfortable and save you money on energy bills. Related Read: Insulating Your Home – Where Do You Get the Best ROI? There is nothing worse than finding insects and rodents in your home! Critters can enter through tiny crevices and holes around doorways and windows. Unfortunately, these openings are also how cold air enters and warm air escapes. By adding insulation you can save on energy bills while protecting your home from vermin invasions. A sign of poor insulation that you may notice during a Kansas City winter, aside from soaring heating bills, are ice dams. 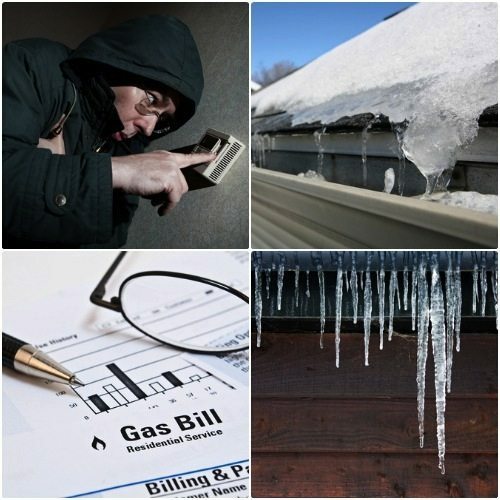 Ice dams occur when heat (rising from your poorly-insulated home) melts the bottom layer of snow off of your roof. The melted water then trickles down towards your gutters and may begin to freeze once it hits the cooler air. The result is large chunks of ice and oversized icicles, called ice damming. It can wreak havoc on your roof and your gutter, not to mention it can turn into a safety hazard for those below. Frozen pipes in your walls are also huge indicators that you have an insulation problem. Proper insulation protects your home from damage caused by Kansas City’s freezing temperatures. Poorly insulated exterior walls can cause frozen pipes, which can burst. This can cause thousands of dollars worth of damage. Contact us to schedule your FREE energy audit.